The following is a recipe I hope you will enjoy. I created it for dinner using a fresh fish we have never had before. 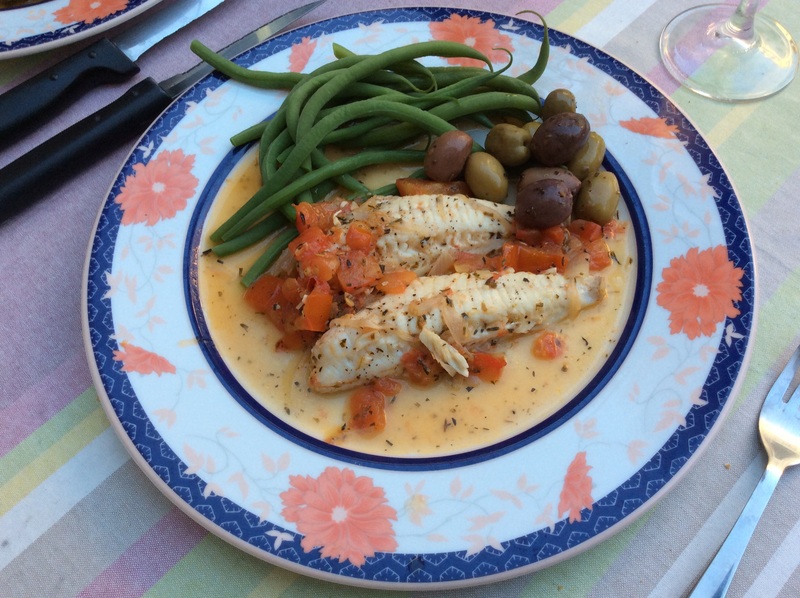 It is called Grondin Rouge in French (Red Gurnard) and comes from the eastern part of the North Atlantic. It was very tasty and had a subtle slightly sweet taste. No worries, any firm flesh fish such as cod, sturgeon, red snapper, or other saltwater fish will do. It is very important, however, that the fish and all the other ingredients be very fresh. Enjoy! Mince the garlic, chop the tomato, and slice the shallot. Pat the fillets dry with a paper towel and season with salt and pepper on both sides. Heat the oil in the pan on medium. Add the garlic and shallots, sauté for a minute to release their flavor. Add the Herbes de Provence and continue to sauté for another minute. Add the wine, salt, and pepper to taste. Add the fish fillets and cover the pan. Simmer the fish for 2 min. on each side or until the fish is cooked to your liking. (Be careful not to overcook the fish as some fish will either fall apart or become tough if cooked too long). Add the lemon juice over the fish. Remove the fish to the serving plates. Add the butter to the sauce (optional). Adjust the seasoning and spoon the sauce on and around the fillets. Accompany the dish with green beans, carrots, or another of your favorite vegetables. Spoon the olives on one side of the plate (optional). Pair with a semi-dry white wine, if desired.